At your picnic or in your home. These tiny workers, ever so dedicated to their queen, are literally everywhere, and we’re guessing that the latest place that they’ve shown up is somewhere that’s got you at your breaking point, whether it be in, on or around your food, water or kitchen area. While they may not be as burly looking as other pests, they’re still much more than a nuisance because they are better organized and bigger in number than most labor unions. Why do I have them? Truthfully, ants, due to their miniscule size, essentially will go where they please, when they please. The main reasons they’ll enter your home is in search of a delightful vacation home, usually near sources of heat, food or moisture, which explains why you’re seeing them in your master bathroom, the kitchen windowsill or underneath (and sometimes, inside) your dishwashing unit. They’re very interested in things in your pantry as well, so don’t be surprised to find them scoping out a quick fix from the sugar bowl or the other snacks you have stocked away! I’d really rather not have them, so how do I get rid of these things? Well, ants, you see, tend to be very stubborn once they’ve found a nice place to live. So, in the sense that you’d call the cops on a neighbor that has broken into your home, call Eco Elite Pest Control to bring down the swift reign of justice on your ant issues with state of the art equipment and treatment methods. 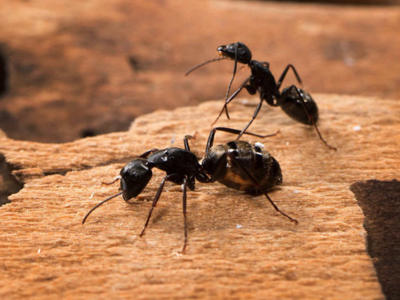 We have family and pet friendly ant control treatments that turn your pesky ants into exterminators themselves, traveling deep into the heart of their own nest with product and distributing it to their family and not even knowing what they are doing. Call Eco Elite Pest Control. We are here to answer all your questions regarding ant control, provide you with an estimate and if you wish have one of certified experienced field technicians out to your home when it’s convenient for you!